SUP paddles is key to your SUP experience. Just think: the water beneath you, the sky all around, your paddle in your hand and each efficient stroke propelling you forward: it sounds perfect, doesn't it? It's important to have a stand up paddle that’s going to give you the result you want and make your experience enjoyable. Paddles come in different shapes and sizes and are made of various materials. Choosing the right paddle—considering ergonomics, shape and size of handle, shaft and blade—maximizes your enjoyment on the water. Experts say that the paddles are even more important than the SUP, since this is what is propelling the board. Paddle tips from Rob Casey. This video points out important tips on paddle parts, how they work along with paddle tips. There’s plenty to consider. If you plan to travel distance or spend a significant amount of time on a paddle board, you might consider a lightweight paddle to avoid muscle strain. Blades that are larger pull more water, but require more effort; narrower blades allow for quicker strokes for racing speed. How that handle handles depends on ergonomics. The overall length of the paddle is very important: how long the paddle is relative to your height has a direct effect on your technique and paddling efficiency. There are basic guidelines for choosing a paddle, but it really comes down to a personal choice. The more you understand about customizing, the more enjoyment your travels will be. 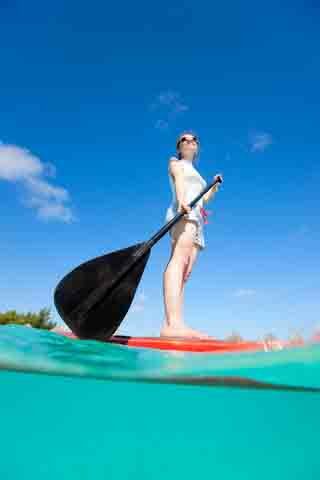 There is more stress on your paddle than on your stand up paddle board. As with SUP boards, there are dozens of makers producing SUP paddles, and the quality varies. A paddle that is built poorly can break and leave you literally up the creek without a paddle. Look for paddle board paddle makers with a reputation for quality. If light weight and strength are important to your needs, consider a carbon fibre paddle. The ultimate in lightweight paddles, these paddles are particularly ideal for long distance paddling, saving on muscle stress and fatigue. Carbon fibre paddles are pricey, but for many SUPers there's just no comparison. This material is light and rigid. Fibreglass paddles are reasonably priced and offer reasonable performance. Usually, the entire paddle is made of wood; they are lightweight, beautiful and are known to have shock absorbing characteristics. They can also be paired with a carbon fibre core, resulting in an even lighter paddle. These paddles are the heaviest of all materials, but very economical. An economical material, aluminum is typically used for paddle shafts. Although not considered a premium construction material, it can be paired with a high quality blade. In cooler weather, an aluminum shaft will be cold to the touch. A foam core paddle offers desirable buoyancy and bracing attributes and is a favourite of many wave surfers. What length will I need? — the most important factor. • The recommended length for SUP paddles depends on how you’re using them, for example flat water paddling versus paddle surfing, in addition to your height. • In general, if you are touring, cruising or racing, the length should be 8 to 10” taller than you are, although some suggest as much as 12 inches taller than your height. Ask your seller for help in choosing the best paddle height for you. • Paddle surfing requires a lower stance, so you will need a shorter paddle. In this case, your paddle should not be more than 8 to 10" taller than you are. If you have a very wide board, you may need a slightly longer paddle to avoid hitting the rails. How to choose a SUP paddle. By StandUpPaddlingTV. • If different people are using the same board, an adjustable paddle makes sense economically. Even if you are the primary user, an adjustable paddle makes a great second paddle for friends or family—plus, it stores easily. An adjustable paddle will be heavier than a non-adjustable paddle. • Any paddle can be cut to appropriate length from the top; the grip is then glued into place. Why are SUP paddles angled where the shaft meets the blade? The angled bend is approximately 12 degrees, optimum for an efficient stroke. The blade is designed to come straight up and out of the water at the end of the stroke, as opposed to lifting the water. What blade shape do I need? 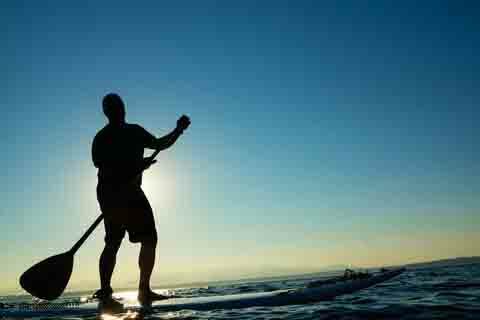 • For stand up paddle surfing, a blade with a larger surface will be your best choice. Since there is more action with paddle surfing, the large blade surface will allow for extra leverage and bracing. • For cruising and touring, a paddle is most comfortable with a smaller surface. A smaller blade means less chance of stress or injury for long distance paddling. • It is worth noting that the blade can also be related to body size. The larger the person the larger the blade size that can be handled. Does the grip make a difference? • The grip is absolutely a personal preference. A palm shape is the most common. There are minor variations depending on the maker. • A tee shape has a smaller grip to be able to wrap your fingers/hands around it more securely for action paddling. • A ball shape is just that and does not have a specific use—it’s just a matter of preference. Why choose a bent shaft? This SUP paddle is designed to promote a neutral wrist position—helpful for reducing wrist fatigue during cruising and touring. Have your say about what you just read! Your paddle boarding comments, stories and ideas are valued! Many thanks! SUP destinations Secrets shared here! Unique race stand up paddle suit without the bulk! From "Paddle Surf Warehouse" a great explanation of styles of boards. Hey out there... Your clicks on the affiliate links sprinkled throughout this site, help to keep this site alive! Many thanks for exploring our affiliate links like the ones to the left and below.